One of our clients, FLAME University, went through a significant rebranding that involved not only a change in the logo but also a change in the name. 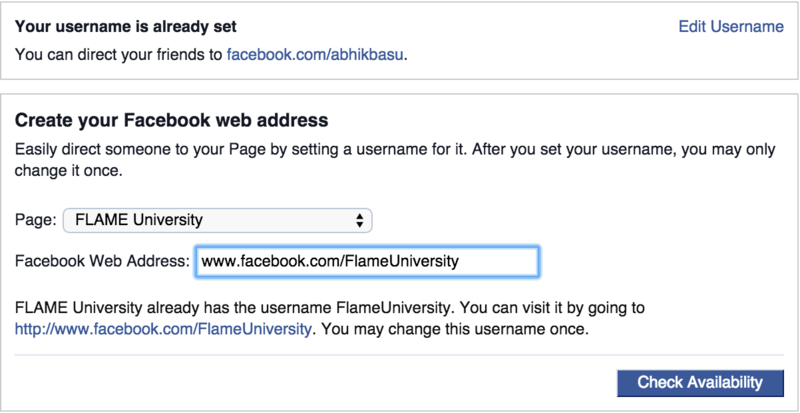 It recently got the green signal to have the word ‘University’ added in its official name so everything had to move to ‘FLAME University’. This is a fairly involved process, depending on how many and which social media channels you are present on, so I thought I’d put this list together to run through the steps involved in doing this. Before getting into the tactical aspects of each of the channels, I highly recommend creating a clear plan of action on a piece of paper. You should cover which channels you want to transition, what is the exact name that you want for each (ideally the same) and which accounts/names you have already reserved from earlier. Once this is done, you can dive into the specifics of each social media channel. I start with Facebook for two reasons: first, because it is still the channel with the maximum reach for brands in most cases and secondly because they only give you one round of doing this. That’s right: Facebook pages get only once chance at changing/rebranding. Which means that you have to be extra sure about the name you are changing too. Also, be doubly sure not to make any silly typos when making the change. It’s important to understand some jargon that Facebook uses for their pages. The page name and the vanity URL are two different entities. It may seem intuitive that changing one leads to a change in the other, but this is not the case. For page name, if your page like counter is over 200, you, unfortunately, don’t have the option to change the page name yourself. By going to the ‘About’ section on your page, you will have to request for a page name change. Don’t be disheartened though – it is still a fairly straightforward and easy process. Your username and vanity URL is linked. This draws a parallel to your personal Facebook profiles as well. This however, is not linked to the number of likes: you can only do this change once irrespective of how many or little likes you have. This can be done by going to the link www.facebook.com/username. If you do this when you’re signed in as the admin of the page, it will take you directly to the page controls. If not, you’ll have the option to choose from the pages you manage. I club these two channels together for good reason: when it comes to rebranding your handles on these two channels, they follow a similar path. Unlike Facebook, there is no restriction on the number of times you can change the handle as long as they are available. Which means, if you have a certain handle right now but are sure to change in the not-too-distant future, then you should claim it and preserve it (much in the same way you would a domain). When the time for the transition comes, the idea is to apply an old-school switcheroo: you replace one handle to another. You open the settings options on multiple tabs on different browsers for both the accounts that you hold. Then change the desired/new handle name by suffixing a number between 1 & 9. This momentarily opens up the handle that you want to transition to and gives you the opportunity to change your old handle to the new one on the second open window. So for example, say the account that has been saved all this while is @pearljamofficial and the earlier handle is @pearljam. You change @pearljamofficial to @pearljamofficial1 so that temporarily @pearljamofficial becomes available. When this happens, you go to the @pearljam account and change it to @pearljamofficial. Once this is done, you can go to @pearljamofficial1 and change it to the older @pearljam so that you still retain control over that. Snap – it’s as easy as that and you’re in with the new handle while retaining content from the old one. That’s one of the biggest advantage of rebranding in Twitter and Instagram over Facebook. With Facebook, you lose all your content when you transition from an old page to a new one. Pro tip: When changing the profile photo in Instagram with the logo of your new entity, be sure to resize the picture before uploading. Since they display a circular image, if you don’t leave space on the margins of the image that you upload it will get cut and make the whole thing appear very unprofessional. Small thing to correct but goes a long way in the impression that it creates. A little more than a year ago, Google merged the admin roles of Google+ and Youtube. It was done as part of their drive to reduce spamming on Youtube. As of this moment, it is necessary for your YouTube channel to be linked to your Google+ page. This process can be initiated by going to the settings page on Youtube and checking the Google+ page that is linked to the channel. Any changes to the page name and/or to the profile photo happen from the Google+ page and will reflect on the YouTube page after some time. This is applicable not just for the name of the channel but also for the profile picture. Edit: Even as I was drafting this post, it has been announced that Youtube and Google+ will be delinking again. It may take a few more months for the split to take place, but just as children in a troubled marriage, we must wait and see what changes finally take place. Have you tried rebranding your social media channels? I’d love to know more about your experiences. Tell me in the comments section below!